UB freshman Sebastian Serafin-Bazan was in stable condition Sunday evening, after an alleged hazing incident at Sigma Pi fraternity in University Heights sent him to the hospital in cardiac arrest early Friday morning. Neighbors reported seeing paramedics perform CPR on Sarafin-Bazin, a medical technology major, as he lay on the grass outside the 69 Custer Street house around 12:30 a.m. Friday. Neighbors described a chaotic scene as police spoke with hesitant students trying to leave the scene to avoid talking to police. 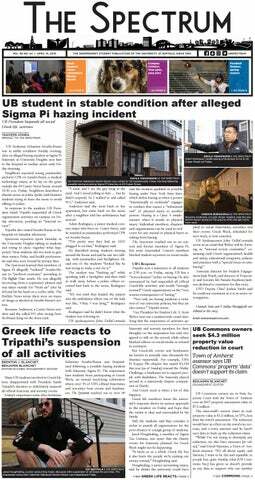 In response to the incident, UB President Satish Tripathi suspended all Greek organization activities on campus on Friday afternoon, pending an “internal review.” Tripathi also visited Serafin-Bazan in the hospital on Saturday afternoon. Spectrum reporters spent Saturday in the University Heights talking to students and trying to piece together what happened. Most students did not want to give their names. Police and health professionals said they were bound by privacy laws. The Spectrum learned that members of Sigma Pi allegedly “ordered” Serafin-Bazan to “perform exercises,” according to The Buffalo News article. He was allegedly recovering from a respiratory ailment and was taken outside for “fresh air” after he fell and hit his head on a coffee table. The Buffalo News wrote there were no traces of drugs or alcohol in Serafin-Bazan’s system. Roxanne Anderson, a Custer Street resident said she called 911 after seeing Serafin-Bazan lying on the front yard. DAVILA TARAKINIKINI | THE SPECTRUM Adam Rodriguez recalls seeing ambulances arrive at 69 Custer Street on Friday. DAVILA TARAKINIKINI I | THE SPECTRUM UB freshman Sebastian Seraﬁn-Bazan was rushed to the hospital early Friday morning following possible hazing involving Sigma Pi fraternity at 69 Custer Street. SAI SEETHALA | THE SPECTRUM Jared Houghtaling, a junior accounting major, discusses UB’s suspension of all Greek-life activities. The suspension came after freshman Sebastian Seraﬁn-Bazan was hospitalized Friday. Hannah Stein and Vindhya Burugupalli contributed to this story. Email: news@ubspectrum.com. BENJAMIN BLANCHET | THE SPECTRUM Men’s Ice Hockey club presents plea to remain recognized. The Student Association senate voted against derecognizing the club at its Friday meeting. The views expressed – both written and graphic – in the Opinion section of The Spectrum do not necessarily reﬂect the views of the editorial board. Submit contributions for these pages to The Spectrum ofﬁce at Suite 132 Student Union or news@ ubspectrum.com. The Spectrum reserves the right to edit these pieces for style and length. If a letter is not meant for publication, please mark it as such. All submissions must include the author’s name, daytime phone number, and email address. JOIN OUR STAFF Do you have an interest in journalism, graphic design, photography, social media, advertising, cartoons or copy editing? The Spectrum is always looking for enthusiastic students who want to be part of our team. Join our 45-time award winning independent student newspaper for hands-on, real-world experience in your ﬁeld. Anyone interested in joining The Spectrum’s editorial staff can email Hannah Stein at: eic@ubspectrum.com. Anyone interested in joining The Spectrum’s professional staff or advertising team can email Helene Polley at: hapolley@buffalo.edu. ive? Are you just fetishizing your racial dating preference? Or do you actually think that race will be beneficial to you over the others? The online dating website, Black People Meet, helps African Americans and African Canadians do just that. The site states that they are dedicated specifically to black dating. They don’t go into specifics as to why, but the reason is pretty obvious. According to journalist Kyndall Cunningham, if you are a minority who chooses to stay within your race, that should be understandable. Cunningham believes racial minorities may feel the need to stay exclusive because they need a safe place where they feel understood. Race is a topic that many people are uncomfortable talking about, especially racial dating preference. No one wants to be called racist based on their preferences, and explaining the choice can be very uncomfortable. But times are changing and we should be changing, and becoming more tolerant, as well. So before you close your mind off to other races for certain features being too small or too big, ask yourself how you would feel if someone said your race wasn’t attractive enough to date. national law. Today, the death toll of the Iraq War is estimated at half a million and there are still an unknown number of black sites operated by the CIA around the world with no congressional oversight on their activities. Five hundred thousand people dying as the result of an illegal war sure sounds like a war crime to me. So does torture. Does the university really believe that we should be celebrating a war criminal like Secretary Rice? DAVILA TARAKINIKINI | THE SPECTRUM The Black Student Union Vice President Daniel Edwards speaks to students to commemorate the life and death of rapper Nipsey Hussle on Wednesday. more involved with the school and student life as a whole, there could be less.” The school-wide suspension is the first since 2002, when two local students drank alcohol at an Alpha Sigma Phi party and later died in a car crash, according to Spectrum records. During the suspension, Vice President for Student Life A. Scott Weber will form an “internal review committee,” to examine each organization’s programs, policies and practices, according to UB Spokesperson John DellaContrada. UB Commons Inc. is requesting a 57% at $7.5 million. options, it’s kind of nice that Baja Blast is a great blend of tropical, almost Ocean is an option,” Vu said. “I’m not huge on Spray flavors.” Mtn Dew Kid wrote that Mountain Dew soda but for Baja ... that’s another story.” Vu said the beverage is probably “flying will be introducing four new flavors this off ” the shelves due to the fact that it was year: Cyclone, Liberty Brew, Street Lightning and VooDew, all of which Campus taken off shelves a few months ago. “With the availability and ease of access Dining can choose as a possible replaceto Baja Blast, it isn’t too surprising that ment Dew. they are selling so quick.” Blogger Mtn Dew Kid, who created the Email:Brenton.Blanchet@ubspectrum.com Twitter: @BrentonBlanchet blog MtnDewKid.com seven years ago, has been drinking Mountain Dew for 35 years and collecting memorabilia for the last 15. He said Baja Blast is in his “top five,” with his favorite flavor of the “70-plus” total flavors still being the original. The blogger wrote that the taste is the reason for its popularity, and described it as “a light smooth taste of tropical flavors.” “It’s a light, non-overpowDAVILA TARAKINIKINI | THE SPECTRUM ering taste,” Mtn Dew Kid Campus Dining & Shops introduced Mountain Dew Baja wrote. “[It is] smooth to drink Blast in early March and says the product is “ﬂying off” with no aftertaste. The flavor shelves. Rachel Robert at CowPok Piercing and Tattoos’ annual fundraiser. Send your pet photos to @UBSpectrum to be featured in a future paper. COURTESY OF TATYANNA WILDS ChoreoLab’s performance titled “POWER: the preservation of order” had students, faculty and guest artists work together to bring new ideas and technology into the Theatre and Dance Department. COURTESY OF IMDB Rapper Rich The Kid opens this year’s Spring Fest on May 4. Back At It” A Boogie Wit Da Hoodie released his second studio album, “Hoodie SZN,” in December of 2018. The album’s lead single “Look Back At It” debuted at No. 95 on the Billboard Hot 100 chart, but soon climbed to No. 32 on the charts. The song reached gold status in the U.S. and sold over 500,000 digital copies. “Look Back At It” samples Michael Jackson’s “You Rock My World” and “Remember the Time.” The song’s heavy beat will make it easy to get excited about the upcoming concert. A Boogie Wit Da Hoodie ft. Queen Naija - “Come Closer” Last semester’s Fall Fest featured a female-dominated performance by three R&B singers, one of which was Queen Naija. Queen Naija’s collaboration with A Boogie Wit Da Hoodie, “Come Closer,” mixes R&B styles and rap. The song begins with acoustic guitar chords that continue to play under A Boogie’s rap verses. The two performers work well against each other, seeming to feed off of each other’s energy. Queen Naija flips the lyrics, seemingly winning the argument in the piece. Lil Baby and Drake - “Yes Indeed” The last of the Spring Fest lineup, Lil Baby, released his debut album “Harder than Ever” in 2018. The album’s second single, “Yes Indeed,” reached critical success, peaking at the No. 6 spot on the Billboard Hot 100 chart and reaching triple platinum status in the U.S. with over 3,000,000 digital sales. Lil Baby made the song in collaboration with Canadian rapper and hip-hop/pop heavyweight Drake. The song’s infectious beat and catchy lyrics make it easy to join in. “Yes Indeed” can keep anyone excited for the future concert. Lil Baby - “Drip Too Hard” Lil Baby’s collaborations with other artists seem to be critically successful. Lil Baby’s collaboration with singer and rapper Gunna resulted in the mixtape “Drip Harder,” which resulted in the two rappers’ most successful piece, “Drip Too Hard.” “Drip Too Hard” peaked at No. 4 on the Billboard Hot 100 chart. The two artists show off their chemistry, with lyrics competing with one another. The two boast their diamonds and private planes and Lil Baby’s rapid delivery is interrupted by Gunna’s smooth vocals to create a diverse competition. Lil Baby - “Never Recover” Lil Baby joins together his two most successful collaborators, Drake and Gunna, in “Never Recover.” The song is one of eight tracks from “Drip Harder” that made it onto the Billboard Hot 100, peaking at No. 15. Each artist brags about their money and the number of records they make. The upbeat braggidocio competition between the artists creates an aura of confidence, allowing any listener to feel their best on the way to Spring Fest. Email: julianna.tracey@ubspectrum.com Twitter :@JTraceySpec. CHOOSE UP TO 4 TOPPINGS! • In restaurant orders only. Online ordering will be turned off on 04/17. • One FREE single cheese burger with up to 4 free toppings per person. Must be present to get free cheeseburger. Must purchase fries, shake or drink. • We will have burgers for a minimum of 400 guests. No rainchecks if we run out. • No other menu items will be available to order this day. • We’ll take the last order at 8pm or while supplies last. • Post photos of your 04/17 burger using #bestburgerever & @Flipburger to be eligible to gift cards we’re awarding throughout the day. 4, 5, 6, & 8 BEDROOM REMODELED APARTMENT HOUSES. 37 apartments available located at University Buffalo Main Street Campus off Englewood. Beginning June 2019: UB South Campus for @ $300-$425/ bedroom plus utilities. Washers & dryers included. Contact bradengel37@gmail.com or Shawn at 716-984-7813 check out our web-site: www.bufapt.com OUR NICEST APARTMENTS RENT NOW!! Newly remodeled 1-4 person APARTMENTS on W. Winspear, Englewood, Tyler Heath & Merrimac. Amenities include Off-street parking, whirlpool baths new ss appliances & free laundry. Live the Sweethome life on south!! Visit www.ubrents.com or call/ text 716-775-7057 to schedule an appointment now! City A1 drivingschool.com Beginners & brush-up driving lessons. 5hr class $30.00 716-875-4662. NATHANIEL MENDELSON | THE SPECTRUM Sixteen-year-old Peyton Longo holds up his National Letter of Intent after signing on as a member of the Bulls. Longo suffers from a form of muscular dystrophy and has joined the team through Team IMPACT. NATHANIEL MENDELSON | THE SPECTRUM UB football alum Chuck Harris, Cameron Lewis, Anthony Johnson and Tyree Jackson sit on the sidelines during the annual spring game. HAO WANG | THE SPECTRUM Sophomore quarterback Kyle Vantrease throws a pass over the middle. The sophomore is the only quarterback on UB’s roster to start a game for Buffalo. 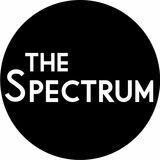 The Spectrum, an independent student publication at the University at Buffalo.